Know that you are reading about what will be remembered as the worst game on the Nintendo eShop for Nintendo Switch. From the developer that released Splash or Crash on Nintendo 3DS comes Vroom in the Night Sky, a far less enjoyable game with an enchanting name that crashes and burns soon after it takes flight. This magical bike action game from Poisoft is remarkable in many ways, but more that it exists in the first place. It certainly sounds interesting enough to take a punt on, but quickly proves to be the kind of impulse purchase that you instantly regret. If you want to check it out it’s worth swinging by the Driving School first, where there are 10 skills to learn for those that want to take the time – whether that be Magical Heavy Breaking, shooting down rivals with Magical Rockets, passing near objects for Magical Thrilling, bumping into the ground for Magical Trampoline, boosting with Magical High Speed, swerving from side to side to make a pointless Magical Turn, using Magical Rockets to collect stardust, somersaulting for a Magical Collision Avoidance, or learning to score more points by collecting stardust while performing a Magical Turn or Magical Thrilling. But, despite their spellbinding names, none of these make the gameplay experience ever feel magical. Instead, riding a magical bike feels far more clumsy and cumbersome than it ever needs to be, which isn’t a problem that you want to have when it’s the key aspect that your game relies on. Riding in the driver’s seat as Magical Girl Luna, Vroom in the Night Sky challenges you to fly around the night sky, collect stardust, open a magical gate with keystars, and then leave. Pulling off the moves that you learn in the Driving School can boost the stardust that you earn, which you can then spend in the shop to unlock nimbler scooters, off-road bikes, and sports bikes to ride into the night skies on. These each have their own speed, power, and handling stats to consider, but it’s likely that you won’t spend long enough with the game to ever care. That’s because there is so little to do. There are multiple, sparse stages based on areas such as a forest, desert, town, factory, and ocean, that, as mentioned before, encourage the player to outpace their rival to gather stardust, keystars, and escape through the magical gate in the quickest time possible. But, these can be completed in a matter of minutes. In less than an hour, you will have seen everything that Poisoft have to throw in your direction. It’s baffling. Everything that you do in Vroom in the Night Sky will reward you with stardust, meaning that unlocking new magical bikes isn’t too troublesome. This is boosted by Memories, which are in-game achievements that will reward you with stardust. There’s even one for unlocking every magical bike if you dare put yourself through that trauma. 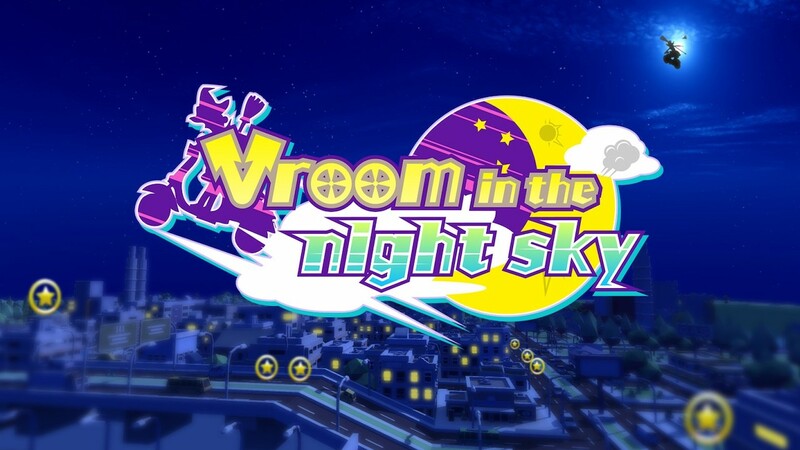 The gameplay woes that Vroom in the Night Sky heavily suffers are compounded with a catastrophically poor localisation attempt. Incomprehensible English is everywhere, whether that be the menus, tutorials, or character interactions, meaning that many will probably have more fun trying to work out what everything means than actually riding around on a magical bike. With an engine sputter, Vroom in the Night Sky is an unarguable disaster. It wouldn’t be unfair to expect the early releases on the Nintendo eShop to showcase the portable home console’s potential. Dull, shortlived, and with an unjustifiable price point, Poisoft, if anything, painfully demonstrates what not to do.